Classical conditioning is a learning process in which an individual learns to associate an unconditioned stimulus that already brings about a particular response with a new conditioned stimulus so that the new stimulus brings about the same response as the unconditioned stimulus. Classical conditioning is associated with psychologist Ivan Pavlov and his classic experiment with dogs. In his experiment, Pavlov conditioned dogs to associate the sound of a bell with the presence of food. Prior to conditioning, the sound of the bell alone did not elicit a response from the dogs, however, the presence of food did make the dogs salivate. As part of the conditioning process, Pavlov paired the food with the sound of the bell so that the dogs began to associate the food with the sound of the bell. The conditioning was achieved when the sound of the bell on its own made the dog salivate in anticipation of the food. Unconditioned stimulus is a naturally occurring stimulus that produces a response without any previous learning. Unconditioned response is the automatic or reflexive response to the unconditioned stimulus. It is involuntary behavior that occurs with no conscious awareness. An unconditioned stimulus produces an unconditioned response. Example: A kiss (unconditioned stimulus) naturally produces an elevated heart rate (unconditioned response). NOTE: The elevated heart rate is a natural response, not a learned response. Neutral stimulus is a stimulus that produces no particular response. 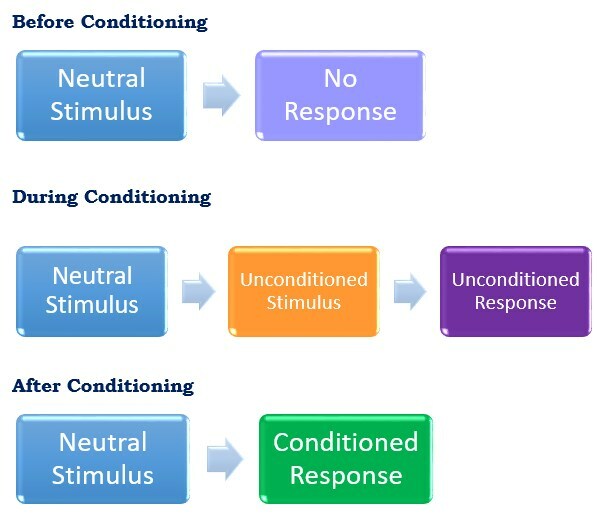 After the association and conditioning, the neutral stimulus becomes known as the conditioned stimulus and the learned behavior is known as the conditioned response. A conditioned stimulus produces a conditioned response. NOTE: Unconditioned response as completely natural, while a conditioned response is a learned behavior. 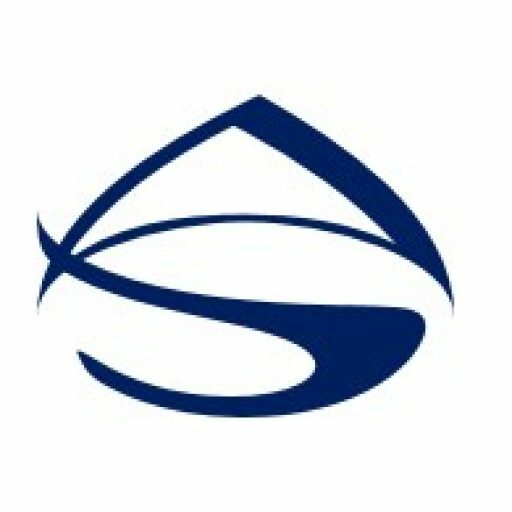 The learning process involves pairing a neutral stimulus with an unconditioned naturally occurring stimulus that already elicits a desired response. Eventually, after continuous pairings, the neutral stimulus becomes closely associated with the unconditioned stimulus. Because of this close association, the neutral stimulus comes to elicit the same response as the naturally occurring stimulus, even without the naturally occurring stimulus presenting itself. Classical conditioning involves three basic phases. In this first phase, a neutral stimulus is also identified. It is referred to as a neutral stimulus because it produces no conditioned response at this point. During the second phase, the neutral stimulus is repeatedly paired with the unconditioned stimulus. As a result of this continuous pairing, an association is formed between the neutral stimulus and the unconditioned stimulus. 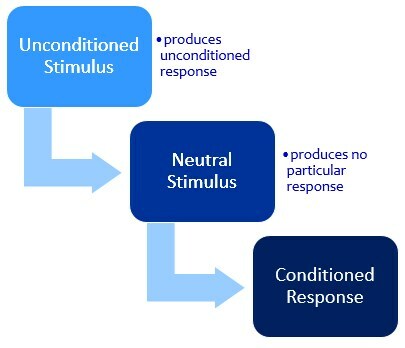 Eventually, the neutral stimulus becomes known as the conditioned stimulus because the subject has now been “conditioned” to respond to this stimulus. Once the association has been made between the unconditioned stimulus and the conditioned stimulus, presenting the conditioned stimulus alone will evoke a response even without the presence of the unconditioned stimulus. This response is referred to as a conditioned response because the response was learned or conditioned. Basically, the subject has been conditioned to elicit an involuntary, automatic, reflexive response to a previously neutral stimulus.